Daycare Furniture: What Creative Furniture Should You Use? 2015 is just around the corner! And a new year brings a fresh start with new resolutions, new beginnings, and possibly a new look. Bring in the new year with a fresh new look for your daycare. One of those elements may be in the nurturing of childhood imagination with some creative furniture we sell here at Worthington Direct. If you’ve purchased only traditional daycare furniture in the past, you’re missing out on some creative ideas that young children will love when they spend the day at your daycare service. You have a wide choice of soft-play daycare furniture that doubles as play devices so kids can have fun without worrying about getting hurt on hard surfaces. Examples include Kinder Size soft chairs and couches that allow kids to be comfortable while also giving them ergonomic design. They’re perfect for lounging around while the kids read or nap. Another great furniture piece that helps inspire the sharing of collective ideas while reading is the Children’s Factory Train Station Set. Designed as an imaginary place where you’d wait for a train, the eight-piece design is set up to hold reading material while including an area for kids to sit and read together. 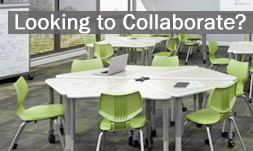 This helps inspire collaboration, which should always be nurtured early. While the above might be steered more toward conventional furniture, some furniture items can truly spark the imagination. Some of these come in something as simple as play mats. Let the children in your daycare stimulate their intellect with mats that essentially turn into games. Angeles’ Spaceline Cot Activity Center, for example, is the ultimate utilitarian play center. This activity center features 20 high quality stackable cots and 4 activity boards. The easy set up and take down enables you to quickly layout the cots when needed and then stack them back up once naptime is over. When cots are stacked and not being used for napping, they transform into a full activity center. Simply snap the activity boards between the stacked cots and voila! This is a huge space saver. While a full activity center is added to your daycare, you don’t have to worry about losing any space to lay out cots for naptime. Children’s Factory matching mat and block set could also be a great addition to your daycare. This multi colored mat allows kids to lounge and match certain colors with a set of colored blocks. This helps preschoolers on a mathematical level and gives them a chance to think and use certain memory skills, while also having fun. It doesn’t take up a huge amount of space either at 57-inches square, so you have room for other imaginative furniture around your daycare business. Also, consider a more budget alternative with Children’s Factory See-Me Picture Mat where the earliest preschoolers can see themselves in a mirror, plus other pictures of your choosing. The easy-to-use picture pockets around the mat give you the freedom to include and exchange up to six pictures that educate or make your youngest preschoolers curious. Need more lounge furniture options that double as full toys? Try our Rainbow Petal Climber with a ball pool that’s a popular item for very young preschoolers. With the unique design, bright rainbow colors, and the small ball pool to play in, it doubles as a place to relax and inspire the imagination. Any child with a vivid imagination will spend hours here imagining him or herself in some other world. Structural furniture pieces that allow kids to play with multiple parts and explore structural designs are great for increasing hand-eye coordination and muscle control. We have several building block sets to choose from, but one of our most popular sets is the Children’s Factory Soft Big Block Set. This 35 piece building block set comes in multiple shapes made out of soft materials so kids can design unique structures without having to worry about getting hurt on hard surfaces or exposed hardware. Building blocks help promote an early sense of structure while giving kids a chance to sit or lounge on what they built as an educative sense of interactivity. Contact us so we can tell you more about our daycare furniture options that can help develop childhood imaginations. Here at Worthington Direct, we’re always focused toward selling quality school items that not only bring innovation and comfort, but also become integrated into a perfect education.